Would you like a simple and fun way to capture your children’s perspective, personality and opinions at various phases of their childhood? Some mom’s are great at scrapbooking or journaling and do this with ease. Others, like me, well…not so much. But fear not, oh ye of little cutting and pasting skills. I have a solution that any mom can create with little effort and big rewards. It will help you learn more about your kids and help your kids learn more about you. It will be a lovely record of everyone’s thoughts through the years. Sounds magical, doesn’t it? So, what is this amazing solution? A family journal is not necessarily a place to record events and happenings. It’s more of a getting to know you book. You or someone in the family writes a question at the top of the pageand then writes everyone’s name two or three lines apart below the question. Throughout the day/week, everyone can check the journal and, when there is a new question, they answer it. When a question is fully answered, someone else can ask a new one. The questions can range from silly to serious. It’s extraordinarily simple and fun. Who doesn’t like to get mail or email? There’s something inherently fun about finding something new just for you. With a family journal, you’ll find everyone “checking” the journal throughout the week just to see if anyone has answered or asked a new question. Your kids will love the joy of discovering a new entry or mulling over questions and answers. There isn’t always time in the day for serious or silly questions, so it’s precious to get that peek into your child’s head and perhaps learn something new about them. Sometimes they’ll feel more comfortable answering/asking questions on paper than they would on the spot with everyone listening. Once you’ve kept a family journal for awhile, you’ll find your kids (and you!) will love just sitting down and reading through it. After a few years, it will be fun to see how handwriting, spelling and favorite things change and evolve. 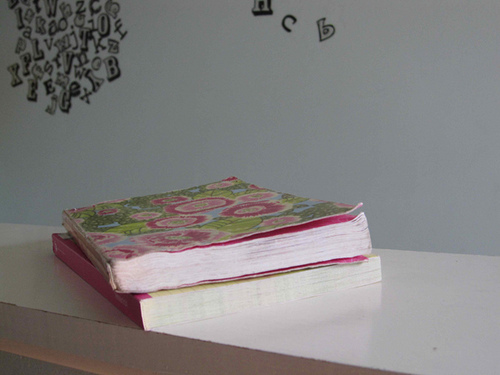 One variation on this idea is to keep a journal with just one of your children. Or you can keep separate ones with each child who is old enough to write. I keep a journal with my oldest daughter and each time we enter a new question, we put it under the other’s pillow for them to find and answer. Sometimes with three children, it’s hard for me to find the one-on-one time I’d like to spend with each of them. The journal is a simple way to create that consistent connection even when life is busy. If your child isn’t old enough to write, or just may not be interested in journaling, you can create an encouragement journal for them. On a regualar basis, write down simple encouragements to them. What a treasure it will be for them in years to come to have a journal full of your admiring and encouraging words. 1. Keep the journal in a public spot where everyone can see and reach it. It’s important that the journal stays in the same spot so that it is easily found and even the smaller members of the family can reach it. It’s also important that it be kept out in the open so that everyone remembers to check it often and the journal stays active. 2. Keep a list of possible questions in the front or back of the journal. It might be helpful to have a list of possible questions so that it is as easy as possible to keep the journal going. Some members of your family might have a more difficult time thinking of questions, so this list can be used as a guide. Your words are some of the most treasured gifts you can give to your children. And their words will be a treasure to you for years to come. A family journal is an amazingly simple yet powerful way to capture all those words in one special place.